This solemn, searching, awful treatise, was published by Bunyan in 1682; but does not appear to have been reprinted until a very few months after his decease, which so unexpectedly took place in 1688. Although we have sought with all possible diligence, no copy of the first edition has been discovered; we have made use of a fine copy of the second edition, in possession of that thorough Bunyanite, my kind friend, R. B. Sherring, of Bristol. The third edition, 1692, is in the British Museum. Added to these posthumous publications appeared, for the first time, 'An Exhortation to Peace and Unity,' which will be found at the end of our second volume. In the advertisement to that treatise are stated, at some length, my reasons for concluding that it was not written by Bunyan, although inserted in all the editions of his collected works. That opinion is now more fully confirmed, by the discovery of Bunyan's own list of his works, published just before his death, in 1688, and in which that exhortation is not inserted. I was also much pleased to find that the same conclusion was arrived at by that highly intelligent Baptist minister, Mr. Robert Robinson. His reasons are given at some length, concluding with, 'it is evident that Bunyan never wrote this piece.' 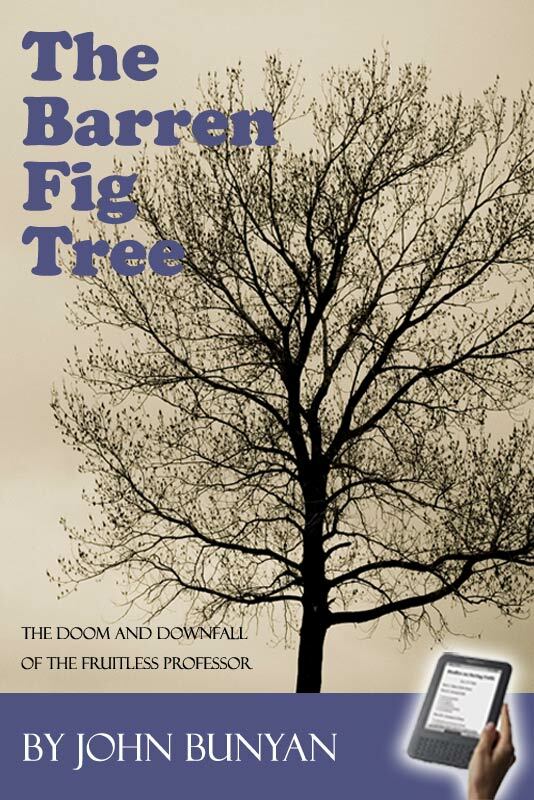 Why it was, after Bunyan's death, published with his 'Barren Fig-tree,' is one of those hidden mysteries of darkness and of wickedness that I cannot discover. The beautiful parable from which Bunyan selected his text, represents an enclosed ground, in which, among others, a fig-tree had been planted. It was not an enclosure similar to some of the vineyards of France or Germany, exclusively devoted to the growth of the vine, but a garden in which fruits were cultivated, such as grapes, figs, or pomegranates. It was in such a vineyard, thus retired from the world, that Nathaniel poured out his heart in prayer, when our Lord in spirit witnessed, unseen, these devotional exercises, and soon afterwards rewarded him with open approbation (John 1:48). In these secluded pleasant spots the Easterns spend much of their time, under their own vines or fig-trees, sheltered from the world and from the oppressive heat of the sun–a fit emblem of a church of Christ. In this vineyard stood a fig-tree–by nature remarkable for fruitfulness–but it is barren. No inquiry is made as to how it came there, but the order is given, 'Cut it down.' The dresser of the garden intercedes, and means are tried to make it fruitful, but in vain. At last it is cut down as a cumber-ground and burnt. This vineyard or garden represents a gospel church; the fig-tree a member– a barren, fruitless professor. 'It matters not how he got there,' if he bears no fruit he must be cut down and away to the fire. To illustrate so awful a subject this treatise was written, and it is intensely solemn. God, whose omniscience penetrates through every disguise, himself examines every tree in the garden, yea, every bough. Wooden and earthy professor, your detection is sure; appearances that deceive the world and the church cannot deceive God. 'He will be with thee in thy bed fruits–thy midnight fruits–thy closet fruits– thy family fruits–they conversation fruits.' Professor, solemnly examine yourself; 'in proportion to your fruitfulness will be your blessedness.' 'Naked and open are all things to his eye.' Can it be imagined that those 'that paint themselves did ever repent of their pride?' 'How seemingly self-denying are some of these creeping things.' 'Is there no place will serve to fit those for hell but the church, the vineyard of God?' 'It is not the place where the worker of iniquity can hide himself or his sins from God.' May such be detected before they go hence to the fire. While there is a disposition to seek grace all are invited to come; but when salvation by Christ is abandoned, there is no other refuge, although sought with tears. Reader, may the deeply impressive language of Bunyan sink profoundly into our hearts. We need no splendid angel nor hideous demon to reveal to us the realities of the world to come. 'If we hear not Moses and the prophets,' as set forth by Bunyan in this treatise, 'neither should we be persuaded though one rose from the dead' to declare these solemn truths (Luke 16:31).